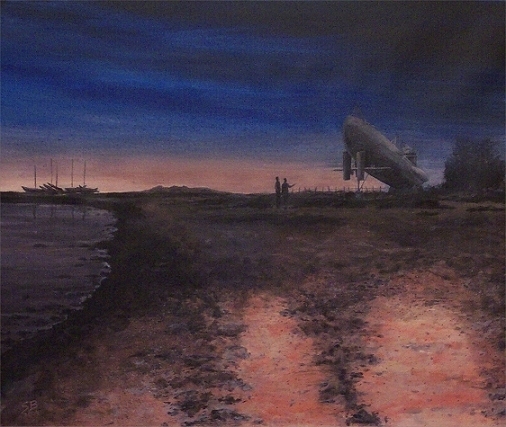 Original artwork is acrylic on canvas measuring approx 20" x 16"
For those of you who have visited U995 - the world's only remaining Type VII U-boat - you will instantly recognise the view as you stroll along the beach in Laboe, near Kiel, in northern Germany. I was fortunate enough to be staying overnight nearby and so during a late evening walk on the beach was able to appreciate the scene in almost solitude: the gentle lapping of the sea together with the sound of halyards jangling against the masts of the nearby beached dinghies all created a peaceful atmosphere allowing you time to reflect and consider U995's history. The following day I visited her interior and marveled at what a day at sea in such squalid conditions must have like for her crew all those years ago. Those of you who have not managed to visit U995 yet, I would seriously recommend it. Definitely worth the trip no matter where you're coming from. There are also plenty of other places to visit in the area - jjust off the painting, to the right of this image, towers the Marine-Ehremal - a monument and museum honouring all German sailors who lost their lives at war. Whilst down the road is the U-boat memorial showing a somber listing of row upon row of submariners' name engraved in black granite - all of whom gave their life for their country. 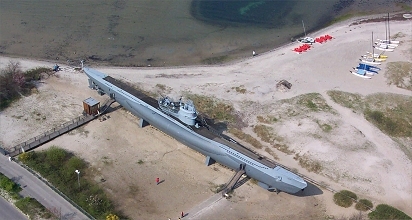 Climbing to the top of the Ehremal creates a great bird's eye view of U-995 as can be seen by the photo below.